Having gone to Chanory Point near Inverness especially for Dolphins and failed to obtain any jumping shots it was an absolute bonus last week when we were on Islay to succeed. 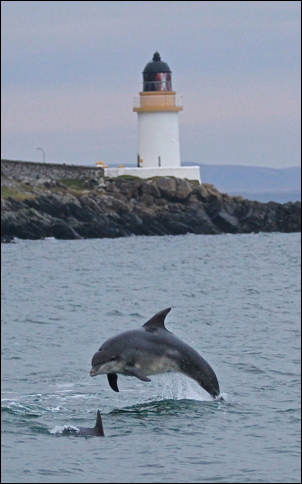 Not only did we have eight passing Dolphins one jumped in the perfect spot with the lighthouse in the background. Autumn on Islay is always special and last week was better than ever. Four days of high tides produced good feeding conditions for Otters and we had sightings of ten Otters during that time. One female came out of the sea with a fish for its young and all this was captured on film.